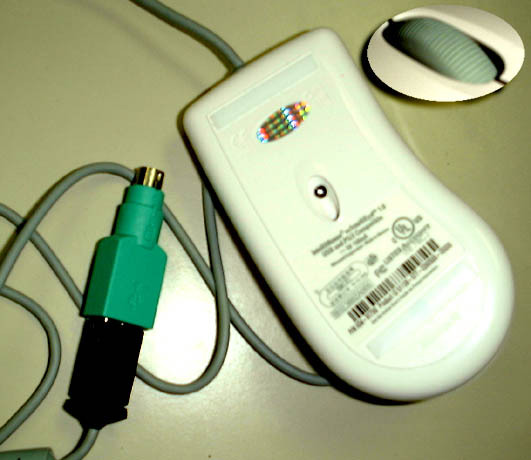 I got this new Microsoft IntelliMouse with IntelliEye. In other words it's standard ergonomically shaped Microsoft Mouse, made of good quality white plastic and It has a scroll wheel. However there are few things that are really new and I believe that it's a new step in pointing devices industry. Major difference is that there is no ball underneath, and it replaced with tiny camera and little red light. Basically it's an optical mouse, and being optical is not that revolutionary, yet main advantage is that you don't need a special [or even any] mousepad, thus it's hand-oriented and this is what make it different and better. Another relatively new thing is that it's USB and PS/2 in the same time. It's achieved by additional electronics inside the rodent plus a usb->PS/2 adapter. Scroll wheal is a bit different as well. It rolls easier [what is not good IMHO] and has little ribs.